Orijen dog treats are made without cooking or preservatives. 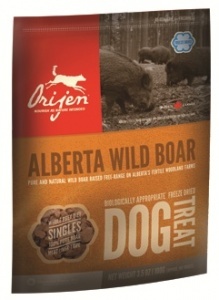 Orijens Biologically Appropriate treats are gently freeze-dried to lock in the goodness and amazing flavours of our authentically fresh and regional ingredients for a reward your dog will truly love. 100% MEAT. 100% FRESH. 100% NATURAL. Alberta Wild Boar is ranch-raised on local woodland farms grazing on tubers and shoots and delivered to our kitchens fresh. It is free of preservatives and antibiotics and gently freeze-dried to lock in all the goodness and taste.